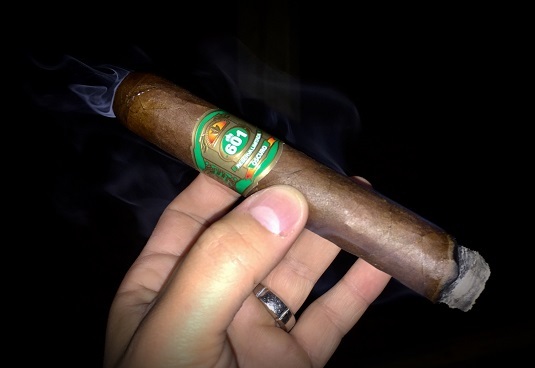 There was a time when the cigars in the EO Brands portfolio—particularly 601 Blue, 601 Red, and 601 Green—were mainstays in my humidors. Back then, Erik Espinosa and Eddie Ortega were still in a partnership, and the 601 line was produced by none other than Don José “Pepin” Garcia at My Father Cigars. In 2010, Rocky Patel bought a 50% stake in EO Brands, which also owned Cubao, Murcielago, and Mi Barrio. Then, in early 2012, Eddie Ortega announced he was leaving the company to start his own outfit called Ortega Cigars. Today, Erik Espinosa operates Espinosa Premium Cigars, which he runs independently out of his La Zona Factory in Estelí. Included in his portfolio is a reincarnation of of the 601 Green, which was always the boldest, most full-bodied blend in the series. It is made with a Nicaraguan Habano Oscuro wrapper around Nicaraguan binder and filler tobaccos. Tronco (5 x 52) sells in the $7 to $9 range. The band of green and gold is familiar yet dissimilar to the more metallic rings that graced the surfaces of the old Pepin-made 601 Greens. Beneath is a dark, oily, toothy wrapper with thin veins and tight seams. The feel is moderately firm yet the foot exhibits a cross-section of somewhat loosely packed tobaccos. The well-executed cap clips cleanly to reveal an extra-smooth cold draw that leaves a faint sweetness on the lips. Once an even light is established, pre-light notes of dried apricot and hay transition to a medium- to full-bodied profile of cereals, warm tobacco, black pepper spice, and espresso. The texture is a bit chalky and the flavor is rich and bold. Before the first quarter inch, background notes of roasted peanut and salted caramel join in to add balance. As the Tronco approaches its midway point, the intensity of the flavors—and the nicotine kick—ramps up enough to merit an upgrade to full-bodied status. A taste of cayenne heat enters the equation. The home stretch is best characterized by an abundant burst of black pepper and espresso. The physical properties are pretty solid from light to nub, including an easy draw, bountiful smoke production, and a well-behaved ash. The burn line does require a couple touch-ups to stay even, however. I can’t in good faith compare this 601 Green to those that were made by Pepin years ago for several reasons. For one, I haven’t had a Pepin-made Green in years, and I don’t trust my memory (plus, even if I could recall the flavor accurately, my tastes have likely changed). Second, this is a completely different cigar that deserves to be judged on its own. Speaking of which, my assessment is Tronco is a well-made, bold, powerful cigar that has a lot to offer for seasoned cigar enthusiasts who are seeking ample strength and Nicaraguan spice. In my book, it earns three and a half stogies out of five. I’ve had both the red and blue and both were very enjoyable sticks and might have a green hiding in my humidor somewhere. Along with the Laranja, all were recommended personally by Erik Espinosa during an event here in KC area. Enjoyed the time spent with him and his insight on the FDA crap. His cigar recommendations were spot on for me. Liked the Laranja enough to eventually buy a box. It is one of my go to cigars when I might have smoked a couple of turds and need a good one. Really like your reviews and other information.